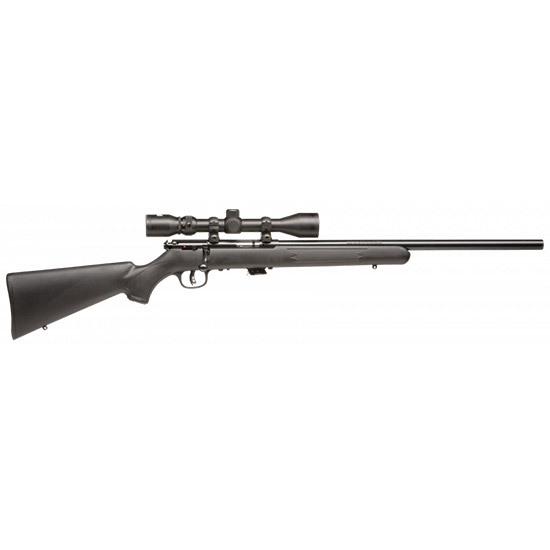 Savage 29200 Mark II FVXP with Scope Bolt 22 Long Rifle 21 5+1 Synthetic Black Stk Blued in. Mark II rimfire rifles add more fun to shooting than almost anything else for the money. From casual plinking to serious hunting this versatile rifle can handle it all with matchgrade accuracy. Its everything you want in a boltaction 22 repeater. AccuTrigger is a standard feature offering a useradjustable trigger pull so theres no need for a gunsmith to modify it. AccuTrigger also provides a crisp clean trigger pull which enhances accuracy. The detachable box magazine and blued 21 carbon steel barrel are set in a black synthetic stock with cut checkering and swivel studs. The FVXP also comes with a 4x32mm scope mounted and boresighted."